CHEFCHAOUEN, Morocco - I was sitting on a roof terrace in the mountain village of Chefchaouen, in northern Morocco, when a French traveler I had met before told me he had been reading a bit about the history of the town. Did you know, he asked, that Americans had bombed the place before? You need to understand that Chefchaouen is kind of in the middle of nowhere in Morocco. A two-hour drive south from Tangier and a four-hour drive north from Fez, there's no particular reason to be there unless you're on holiday. 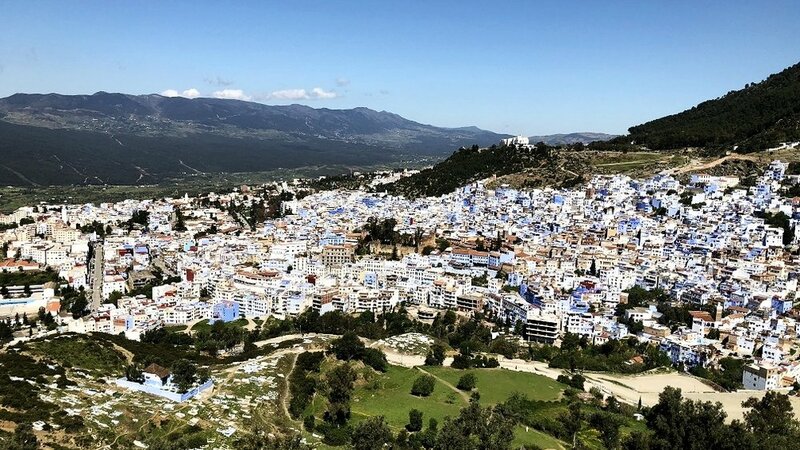 Today Chefchaouen has become a popular stop for travelers thanks to its tranquil nature, mountain air and the distinctive blue-shaded walls that run along the narrow footpaths in the city's old part of town. Why would anyone bomb Chefchaouen? But a little research led me to an odd story that centered around an American adventurer named Charles Sweeny, who was reportedly an inspiration for some of Earnest Hemingway's writing. Sweeny, it appears, was somewhat bored after the close of the First World War, where he had flown in a nascent air force with the French Foreign Legion. In a biography on Sweeny written by Charley Roberts and Charles Hess, the pair note that Sweeny had always been a support of a people's self-determination, so it was odd that he would want to throw in his lot with the French empire, but they say Sweeny's comments at the time indicate that this was a special case. So Sweeny and more than a dozen like-minded friends and compatriots, all veterans of the Great War, formed an American volunteer air unit, against the wishes of the U.S. government, and offered their services to the French military. The French accepted, and that's how one of the volunteers, Capt. Paul Rockwell, found himself doing bombing runs over northern Morocco and over Chefchaouen in particular. He later wrote, "The city looked lovely from the air, hugging its high mountain and surrounded with many gardens and green cultivations… I looked down upon the numerous sanctuaries, the six mosques, the medieval dungeon, the big square with its fountain playing and fervently hoped none of them had been damaged... I regretted having to attack a town that always had maintained its independence except for a few years of Spanish occupation." 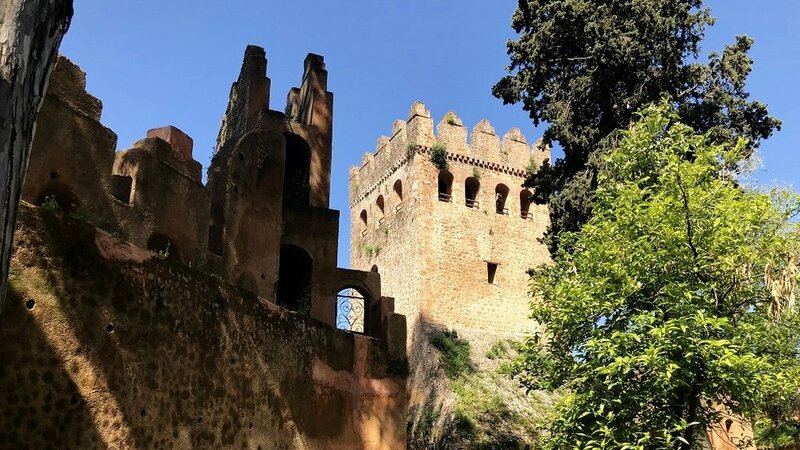 In the same recollection, Rockwell wrote that Chefchaouen itself had been chosen as a target because it was known to be a holy city for one of the many tribes in the region, and an attack on the city was supposed to convince that tribe not to throw their lot in with El-Krim. It's unclear if that particular goal was achieved, but North African military historian Douglas Porch told me Sweeny's men may have earned one dubious honor: the bombing of Chefchaouen, in which civilians were largely the victims, was one of the first ever bombings of civilians by airplane in history. Roberts and Hess write that American public opinion, already sympathetic to a foreign people's fight for freedom from an empire, turned hard against Sweeny and his men after the Chefchaouen bombing, so much so that the French disbanded the unit six weeks after it started operations. When I visited Chefchaouen recently, I could see no obvious sign of the bombing. Some highlights of the town's long history, posted in the kasbah, do not mention the American attack. Either way, it appears that nearly a century later, all is forgiven. I tried to ask a young waiter at one of the restaurants across from the kasbah if he had heard about the bombing. I told him I was planning to write a story. "Oh, no. But you can just Google it, man," he answered, before telling me about a Moroccan pop star I should follow on Instragram.